While most people dispose of old vehicle by sending them for scrap or recycling, there are endless opportunities to do something more inventive. Today we take a look at large-scale vehicular art around the world, beginning with Florida’s Airstream Ranch. While it may look as though 8 large trailers have plummeted nose-first from the sky, they were in fact carefully placed by Frank Bates, who happens to own a nearby RV dealership. Google’s 45-degree imagery gives us a great look at the installation from the air. 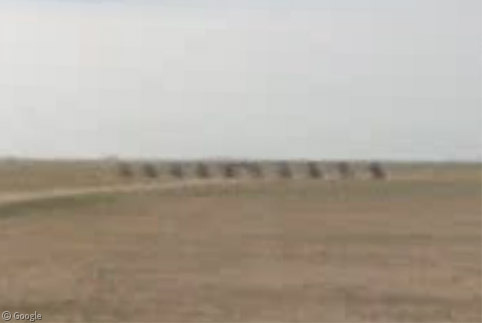 We visited Cadillac Ranch back in the early days of this site. The satellite imagery hasn’t improved, and while there is now a Street View, it’s sadly from the very early low-resolution systems. We visited Carhenge – another well-known car sculpture – in our Monumental Wannabes post last year. If you have a few hundred thousand dollars to spare apparently it’s now for sale. 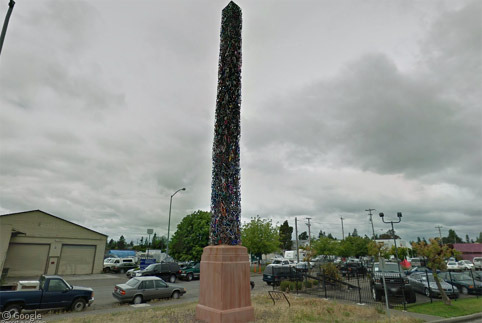 We switch modes of transport briefly for a visit to a monument in Santa Rosa, California, that at first glance appears to be a fuzzy obelisk. 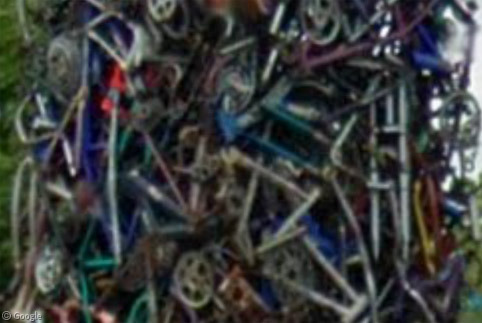 Closer observation reveals that it’s actually constructed of bicycle frames – three hundred and forty of them (and one tricycle) according this Wired article. Created by Mark Grieve and Ilana Spector the sculpture is named Cyclisk and stands almost 20m tall. 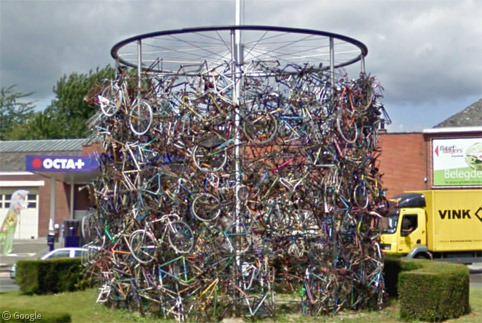 Google’s newly-released Street View imagery of Belgium allows us to see another bicycle sculpture in the town of Brakel, which is on the route of the Tour of Flanders spring classic race. Returning to car art, we move to Sydney, Australia, where a large rock appears to have played a key role in a terrible accident involving a red Ford Festiva. This is actually a sculpture named Still Life With Stone and Car, by artist Jimmie Durham, and it was created through the relatively simple process of, um… dropping a large rock on a car. Originally placed near the Opera House, the sculpture was later moved to its current location where a pair of signs help dissuade any unknowing passers-by from calling the police to report the accident. Sadly, this kind of cruel vehicular torture isn’t isolated – in 2009 we visited two places where cars have been impaled in the name of art. 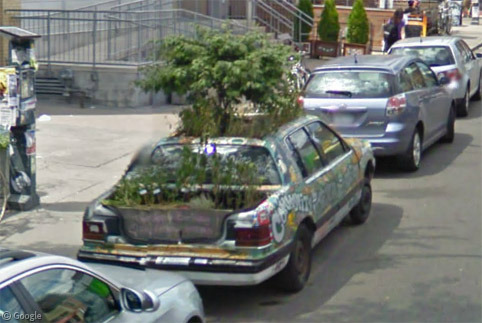 In Toronto this car appears to have been abandoned for so long that it has been reclaimed by nature. Commonly known as The Garden Car, it is more officially called the Community Vehicular Reclamation Project. More details can be found in this blog post. 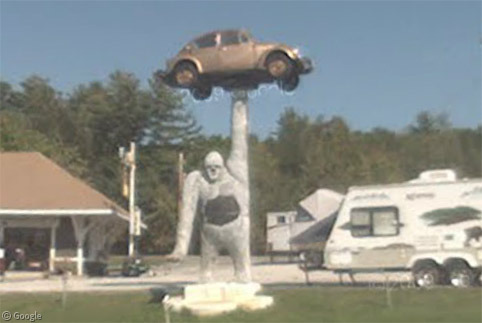 Perhaps the most bizarre vehicular artwork can be found in rural Vermont, in the form of a large concrete gorilla holding aloft a Volkswagen Beetle. The story behind its creation can be found at Roadside America. To wrap up, a few artworks about which I haven’t been able to find much information. 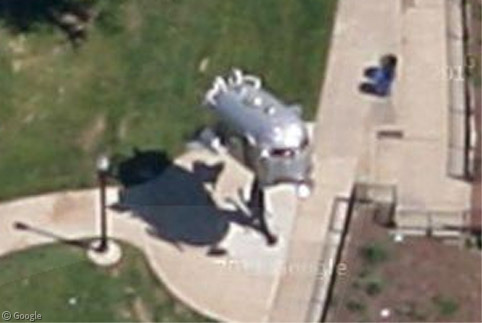 First, another Airstream trailer which has been converted into a spaceship in a park in Sacramento, California. 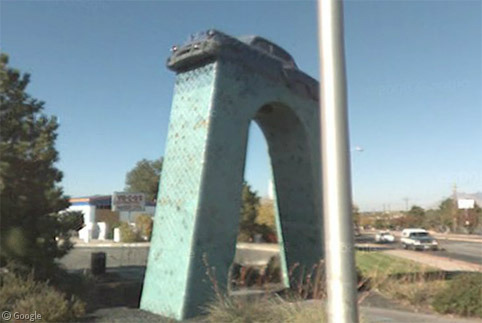 In Albuquerque an old Chevrolet has been tiled for some reason, and mounted on top of an arch. 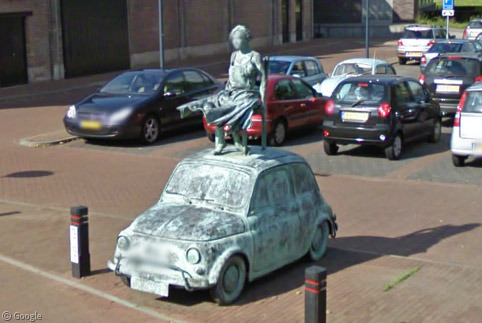 And finally, in Geldrop, the Netherlands, a tiny old Fiat 500 has been bronzed and topped with a statue of a girl – the work of artist Carla Rump. If you know of any other vehicular art, please post it in the comments. I’d particularly be interested to know if anyone from Stockholm knows if this bus-made-of-cars is visible on satellite or Street View. I really wanted to include it in this post but couldn’t find a precise location for it. 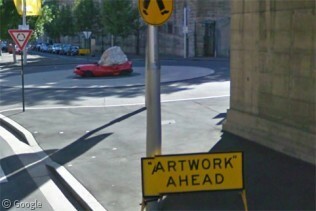 I love it that the sign before the rock-on-car sculpture says “ARTWORK” AHEAD — clearly the Sydney public works dept. didn’t think much of this “artwork”. That obelisk is actually in Santa Rosa, California, not Santa Clara. I like the car crushed with the rock. I was there when the rock was lowered onto the car at the Sydney Opera House in 2004. Very strange thing to watch. The car was shiny and brand new. Thanks for reminding me. I love this blog. Sutter – thanks for the correction on city name, I have fixed the post. Matthew – that’s awesome that you witnessed that! Was it dramatic with the rock being dropped from a height, or was it lowered slowly so as not to risk it bouncing off to crush bystanders? 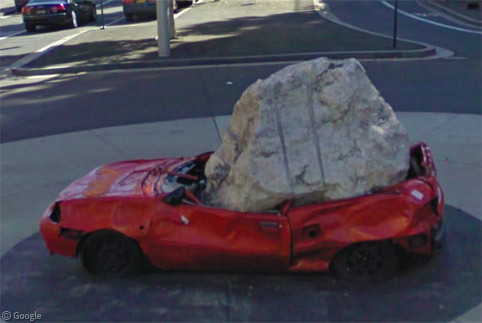 I’d also be curious to know how they moved it to the new location – all in one piece or did they remove the rock and replace it when the car was moved? It was lowered very slowly, but that was cool, not disappointing. No idea how it was moved: it stayed there for as long as I can remember, but I was only in Sydney for a couple of months. I may have some photos somewhere, I’ll see if I can dig them out. About the coach-of-cars, go to View Placemark (59.5603,17.8952) (place yourself on the smaller road, not on the E4 motorway), look approximately NNE (perhaps NNNE) and zoom in quite a bit, and you will have the same view as the sequence at 3:05 in the youtube clip, with the barns (or whatever it is) in the background so the sculpture was somewhere in the fields east of the E4 and slightly north of that point. Thanks Ture. I spent quite some time scouring the roads around the airport, but hadn’t looked that far out of the city. Too bad the coach-of-cars wasn’t there when the Street View car went by! There is a nice old car in Moscow. http://bit.ly/vZQ5fV Really it is monument of russian clown Nikulin, placed near the cirkus of his name. Hi Crimso, I fixed your original link. Thanks for the car/art! the ufo is a leftover of a outdoor art project years ago.